There are several treatment options for a missing or damaged tooth or teeth, like veneers and crowns. However, dental implants provide a number of benefits that make for a better long-term investment overall. Here are some great reasons why you should consider dental implants if you need to replace a damaged or missing tooth. Get permanent results Other alternatives, such as dentures or crowns, will deteriorate and even break. Because dental implants are anchored directly to the jawbone, proving greater stability and they can last an entire lifetime as long as you provide them with proper care. Prevent getting deeper oral health problems Missing teeth can create opportunities for your teeth to shift and these new spaces become a breeding ground for bacteria and cause tooth decay and gum disease. Dental implants eliminate such gaps and hold the surrounding teeth in place. This means you can keep your jaw from shifting and potentially changing your jaw shape. More effective oral function Implants hold in place very firmly and this is because they actually fuse to your bone over time, just like as if they are real teeth. The stability provides better functionality than other alternative because you won’t have to worry about changes in speech or an appliance falling out. Get back your natural smile An implant can give you back your natural smile without sacrificing the aesthetic quality of your smile. They can also match the color of the implant to the specific color of your teeth, giving you a more natural smile. This allows them to blends seamlessly with your existing teeth. A more convenient option Dental implants provide a more permanent solution so you can care for them like your natural teeth. Healthy oral healthy hygiene habits like regular brushing and flossing after meals to remove lingering food particles can let your implants last a lifetime and lessen your daily worries. If you live in Rancho Cucamonga, CA give Golden Smiles Dental a call and any one can help you with any questions about dental implants. Call us at (909) 481-8990 to schedule an appointment today. Many patience face the decision of whether or not to get a dental implant with a certain amount of fear or confusion. What exactly does that procedure entail? What might you expect? This article will discuss some of the basics about dental implants. If you are left with more questions after the article, give Golden Smiles Dental in Rancho Cucamonga, CA a call to speak with a dentist who can answer your questions. Call us at (909) 481-8990 to set up an appointment today. The truth about dental implants is that they provide you with much more than a great smile. They can play an integral role in maintaining your oral health. When a tooth is missing, due to decay or loss, dental implants preserve facial structure and prevent the jaw bone from deteriorating. After the loss of a tooth, adjacent teeth can shift and create a gap that becomes a potential breeding ground for bacteria, leading to more infection. Another option to consider is the cost. While the procedure is usually more expensive than a bridge or a crown, however the results are permanent and do not require much maintenance. The implants are anchored directly into the jaw bone, creating a strong foundation for the artificial teeth. This means that the implant will not require additional maintenance or replacement. Other factors to consider is that the fear surrounding getting an implant is the biggest obstacle for many. Really, the procedure is a simple one, with the dentist using an anesthetic during the procedure and most patients feel little to no discomfort. Most patients can use over-the counter medications to manage pain following the procedure. This means that dental implants are not as painful as you might expect. A winning smile may be worth the pain. If a dental implant sounds like a good fit to you, call Golden Smiles Dental in Rancho Cucamonga, CA at (909) 481-8990 a call to speak with a dentist who can answer your questions. How does Pregnancy affect your Oral Health? Avoid sweets, as sweets provide a excellent food source for harmful bacteria. As a precaution, avoid dental treatments during the first trimester and the second half of the third trimester. Let your dentist know you are pregnant. Eat a healthy, balanced diet. Your baby’s teeth develop in the third month of pregnancy, so you want to be sure to be eating plenty of good nutrients to feed the growing baby. Pay special attention to your gums, and if you see any changes call your dentist at Golden Smiles Dental (909) 481-8990 right away. Maintain good oral hygiene, brushing at least twice a day, and flossing at least once a day. Try a softer toothbrush if you cannot stand brushing your teeth due to morning sickness. Finally, never skip routine dental checkups, as these are vital to keeping track of your dental health. Taking care of yourself is the beginning of good health for your baby. Call Golden Smiles Dental today to schedule your appointment: (909) 481-8990. When should I get my Wisdom Teeth Removed? Many young adults go through a routine procedure to get their wisdom teeth removed, with an estimated 10 million wisdom teeth removed from 5 million people a year. Sometimes, though, surgery is not necessary. You can trust Golden Smiles Dental in Rancho Cucamonga, CA to be able to provide you with the expertise and the care to help you decide if getting your wisdom teeth removed is the next best step for you and your oral care. What makes Wisdom Teeth Wise? Wisdom teeth are your third and final set of molars that typically emerge in the late teens and early twenties. If they can be properly aligned and healthy, these teeth can be a valuable addition to your mouth. However, it is more common for these teeth to not be aligned, and this can have disastrous effects for the rest of your mouth. They can come in horizontally, angled inward or outward, or tilted toward or away from your second molars. 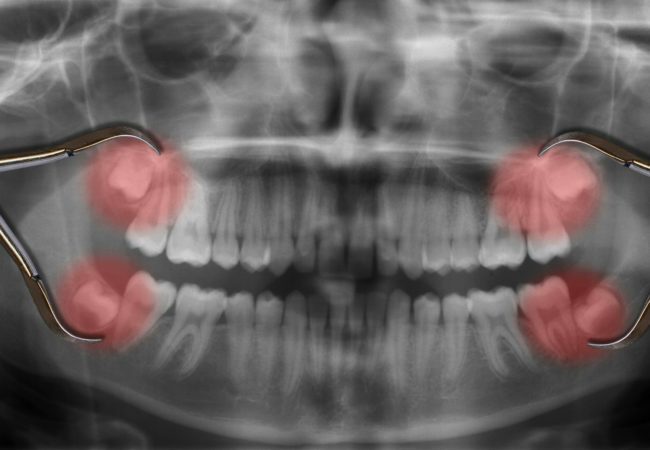 Any misalignment can cause crowding and even damage to adjacent teeth, your jawbone, or your nerves. Additionally, there stems another potential issue from when the wisdom teeth come in impacted or enclosed within the jawbone or the soft tissue in a way that only partially breaks through the gum line. This partial eruption creates a perfect venue for infectious bacteria to enter your teeth and grow, causing an infection. Because these partially-erupted teeth are hard to reach and hard to clean, they become the perfect avenue for future tooth decay to take hold. Damage to the jaw. Cysts can form around the new wisdom teeth, and if left untreated for too long, can cause damage to the surrounding nerves and hollow out your jaw. Inflammation of the Gums. The gum tissue surrounding the wisdom teeth can become sensitive and swell, which can to pain and a more difficult mouth to clean. Sinus issues. Sinus pain, pressure and congestion can all arise as a result of the inflammation in the gums. The real danger of unremoved wisdom teeth. The swelling caused by inflammation can create pockets in which bacteria can hide and create cavities. Regular check ups can keep you one step ahead of tooth decay, and your dentist will be able to tell you if you need wisdom teeth removed. Make sure you keep to your schedule of routine check ups. Call (909) 481-8990 today to arrange your appointment at Golden Smiles Dental, in Rancho Cucamonga. Flossing may have a bad reputation, but its benefits are numerous and its role in your oral health is key. Simply brushing your teeth leaves two sides completely untouched, but flossing allows you to reach those sides and keep plaque build up from happening in some of the hardest to reach places. Flossing is the best way to prevent plaque build-up from happening between your teeth. Plaque is a kind of residue created by bacteria in your mouth after they consume bits of food and drink that are left behind after you eat. It is a soft film that builds up on your teeth, that is home to many harmful bacteria. The plaque will eventually harden into tartar if left to sit on the teeth. Plaque can be removed by daily brushing and flossing but if it is left to harden into tartar it can only be removed by a dental professional, costing you time and money and a trip to the dentist’s office. The plaque is especially harmful as it is acidic and will eat away at the surface of your teeth, causing cavities to form. When left untreated for a long period of time, the cavities can worsen, resulting in major tooth pain and may even necessitate the tooth be removed! Toothbrushes are fantastic at removing plaque from three of the five sides of your tooth, the front, back, and chewing surface. That leaves two surfaces that are yet to be cleaned – this is where floss comes in. Flossing should become a major part of your daily routine. Flossing often seems tedious and time-consuming, but with tools like a dental floss holder or even a dental pick, the process becomes incredibly easy. You no longer have to figure out how much dental floss or dental tape to use, just pick up and go! These tools allow you to simply begin flossing, going through your entire mouth start to finish without worrying about the floss slipping or how to get in weird angles. If you leave the plaque hidden between your teeth it is only a matter of time before it sinks below the gums. Gingivitis is a form of gum disease that creates inflammation and redness in your gums right around the teeth. Gingivitis, thankfully, is easily prevented simply by maintaining good oral hygiene. Brush at least twice a day, and floss daily. This can help you prevent, and with your dentist‘s help, maybe even reverse gingivitis. When left untreated, gingivitis evolves into a more serious form of gum disease: periodontal disease. This disease is often referred to as gum disease. It causes the inner layer of the gums and bone to pull away from the teeth and form pockets. These small pockets can get small bits of food stuck in them, and become infected with bacteria. The bacteria and the toxins the bacteria produce can enter your bloodstream causing all kinds of havoc throughout your body. It can also destabilize the jaw bone and you can actually lose a tooth all because of not flossing! According to the ADA (American Dental Association), gingivitis and periodontal disease are the leading causes of tooth loss in adults. Flossing each day will not only save you your teeth but save you money too! Flossing helps you look younger! Gum disease and the associated bone loss and potential tooth loss associated with it, will change how your face is shaped and give you an older appearance. Keeping your teeth clean and healthy will give you a youthful smile and face shape. 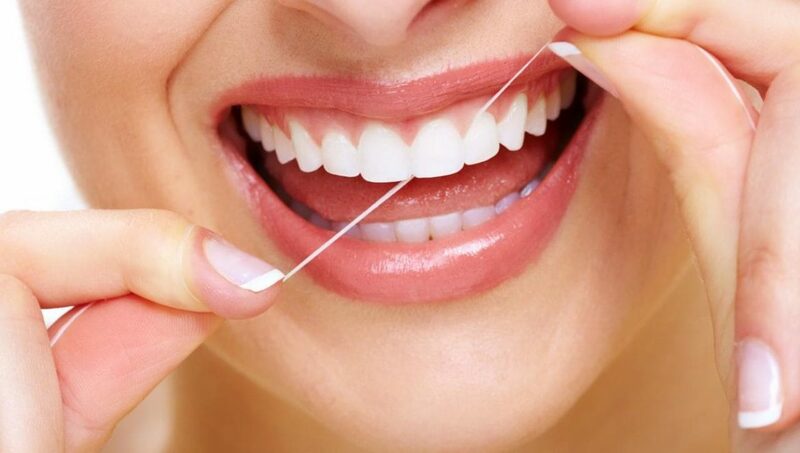 Floss at least once a day and you will not only look younger but you will be able to keep your smile for a long time. Flossing should be a fundamental part of your daily routine. The benefits of flossing once a day are well worth the few minutes it takes to clean your teeth. Flossing helps you fight against plaque build up and keeps your teeth and mouth healthy and happy. For more information or for tips on how to floss, speak with your dentist at your next visit and they will be happy to show you proper flossing and brushing technique. Why choose a dental implant over a bridge? The decision of what to do when looking to replace a tooth often comes down to wondering what the difference is between a bridge and an implant. Your dentist will be your best resource in determining a good option for you, but replacing the tooth is the best option for your long term oral health. Implants have a reputation of being costly, but they offer a decades-long solution to a missing tooth and are as close as you can get to getting your natural tooth back. Bridges are sometimes cheaper, but they often are a lower quality option. As if it was never gone! 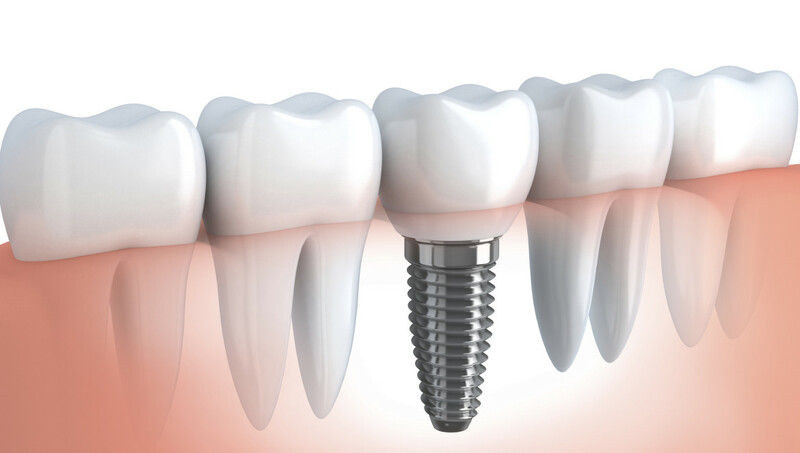 A dental implant replaces the missing tooth in both form and function. A small metal post is set into the jaw bone, and a crown, generally made of porcelain, is fitted on top of the post. The jaw bone will actually grow around the post, anchoring it securely in your jaw as a natural tooth. The porcelain crown is colored to match your natural tooth color and retains the same durability and strength as a natural tooth. Unlike bridges, there is no slippage or squeaks, and there is no risk of jaw decay, as the jaw bone grows around the implant. In order to be fit for a bridge, you actually have to lose a portion of the healthy teeth surrounding the gap. Then the bridge is fitted over the gap, which is simply covered up by the bridge. Bridges work for people whose jaw is not strong enough or thick enough to carry an implant, but a dental implant gives the best and most reliable option. The implant procedure is generally done over a few sessions, starting with a consultation. The jaw is prepared to accept the implant and may require a bone graft if the jaw is not strong enough or not thick enough. Then, the metal post is placed in the jaw. After the sometimes months-long healing process, the crown is placed and the implant is done! The process to get an implant can sometimes take months of healing, however, you get decades or a lifetime of use from the implant. Bridges often must be replaced as the teeth around the gap shift, causing gaps to form. With the implant, however, you retain your natural smile and never have to worry about it again. You aren’t just investing in your smile but in your ability to speak clearly and eat without undue trouble. The health of your mouth is demonstrative of the health of your body. The better you can keep your oral health, the healthier you are overall and the less susceptible you are to getting a number of mouth and gum diseases. A dental bridge can be a good option for some, but you do not fill the gap left and your remaining teeth will shift position over time. This can dramatically change your smile and even the appearance of your face. A dental implant prevents that from ever happening. The titanium post will root into the jaw, just like the roots of your natural teeth. This preserves your jaw bone and prevents any jaw loss or decay. Implants offer a great option for both replacing a missing tooth and keeping your natural smile. They allow you to keep your natural bite, and you can feel secure that you are able to live your life just like before when you had your natural tooth. Choosing to get a dental implant is an important decision. Knowing how the procedure is generally done and what a typical treatment plan entails can help you to make the best decision you can. In brief, the treatment plan involves replacing the tooth roots with a metal post, typically aluminum, that resembles a screw. Attached to that are an abutment and a crown, and it functions essentially as a natural tooth. Dental implants are a great alternative to dentures or bridgework., which may slip or click. There are a number of factors that change how the surgery is performed. These factors include the type of implant that is going to be used, the condition of the jawbone and how much available bone tissue is present and how soft it is. Your doctor will work with you to make a detailed treatment plan that covers all the specific in’s and out’s of your personalized treatment plan. A dental implant is an excellent option for patients that are missing one or more teeth, as well as having the needed amount of bone structure for the implant to be set in. Having healthy oral tissues is a must, as well as a willingness to commit to a potentially multi-month-long process of healing and recovery. However, a dental implant is a lifelong investment, as unlike conventional dentures and bridgework, they do not need to be replaced every five to ten years. 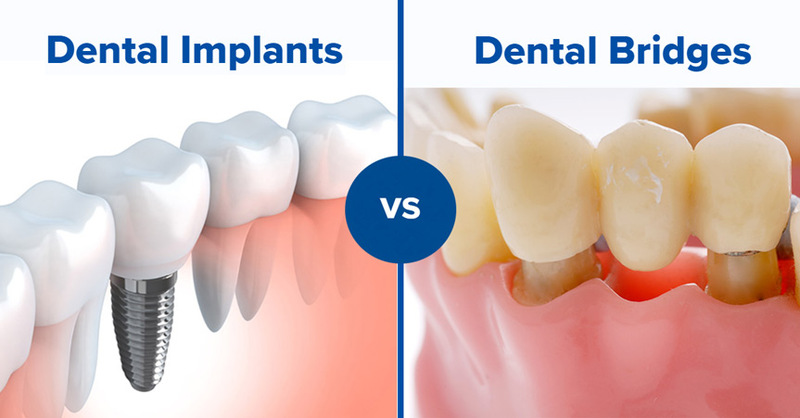 There can be no slippage or clicking with a dental implant, as it fuses directly to the jawbone, just like a natural tooth root. A comprehensive dental exam in which you get x-rays taken and models of your teeth and mouth are made. A treatment plan in which all the factors going into your specific treatment is laid out and considered by your dentist. Input from dental specialists to assess if a bone graft or other preparatory measures are needed. Tell your dentist about all medications you are currently taking, including any over-the-counter drugs and supplements you take. Also, be certain that your dentist knows of any preexisting medical conditions you may have, so they can account for them during the course of treatment. Your dentist may prescribe antibiotics before the surgery to prevent infection. During the surgery, you may have multiple options for anesthesia which can include options such as a local anesthesia, sedation, or general anesthesia. Be sure to discuss with your dentist which option you feel most comfortable with. Keep in mind that If you choose to go with general anesthesia, be sure to plan to have someone take you home after the surgery so you can spend the rest of the day resting. Typically, a dental implant surgery is an outpatient surgery performed in a few stages. The first step is to remove the damaged tooth or teeth if still present in the jaw. The patient’s jawbone is then made ready for the surgery. This may involve getting a bone graft if the patient’s jaw is too thin, or not hard enough. A bone graft may be necessary because the chewing exerts powerful forces on your jaw and mouth, and if your jaw cannot support the implant, it will very likely fail. A bone graft, generally taken from another part of the body, may require additional months recovery as they wait to have it heal. The next step is to place the metal post of the implant into the jaw. This requires an additional visit if you needed to get a bone graft. Following this is a healing period that may take many months. It is because of this healing period that dental implants are only recommended for patients in good health. The healing process is for the jaw to grow around the implant to secure it into place, just like a natural tooth root is secure in your jaw bone. The length of this process varies depending on the patient. Next, the oral surgeon will place what is called an abutment. 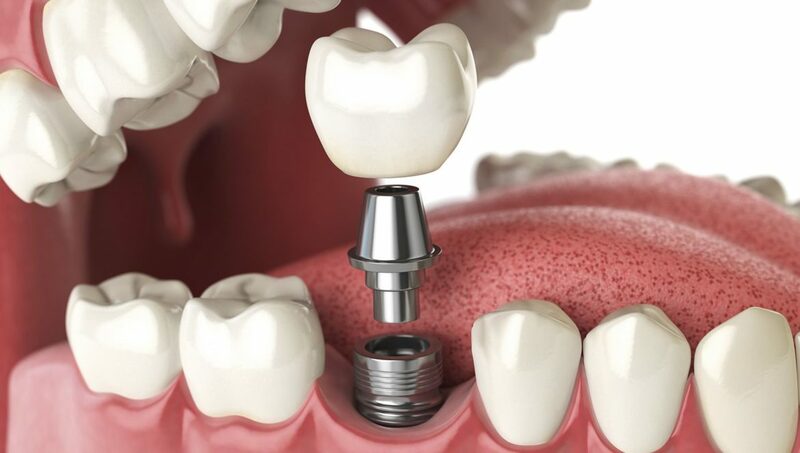 An abutment is the part of the implant which allows the crown of your new tooth to be attached to the implant. In some cases, if the jaw is strong enough and the implant is very stable the abutment can be attached at the same time as the implant is placed. 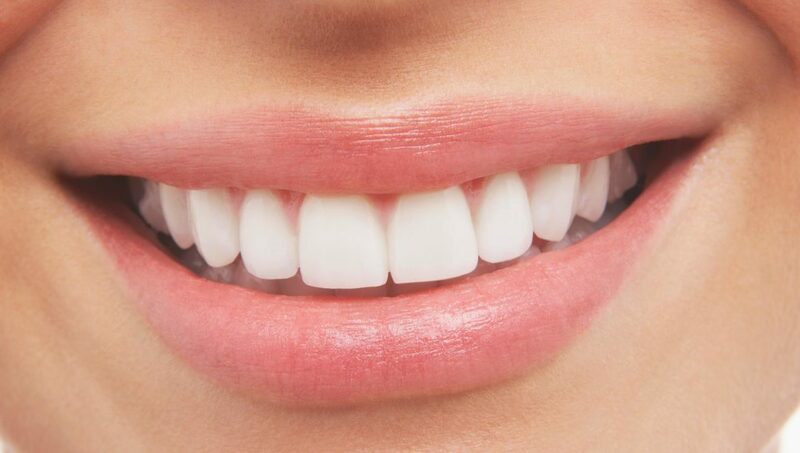 Finally, after the soft tissue heals the creation of the new tooth begin after molds of your jaw and teeth are taken. Once the crown is ready, it is placed and now have a brand new tooth! The process takes many months, most of which are devoted to recovery and healing. It is very common to experience significant swelling and discomfort in the area of the surgery. Symptoms can include swelling of the face and of the gum tissue, bruising of the same areas, pain at the implant site, and minor bleeding. Your dentist may prescribe you pain medication to help manage your pain. If the swelling worsens or there is any other problem after the surgery contact your oral surgeon. You may also have to stick with soft foods for a while as your jaw recovers, but the investment is worth it. You now have a new tooth, that can relieve you of all the hassle that comes with dentures and bridgework. Why Do I Want an Implant? An implant is not like a denture or bridgework. It is a replacement tooth. While the surgery may be involved, the return means a lifetime of use. It will look and function exactly as a natural tooth does, and won’t require special cleaning or often for you to remove it as some denture types require. Practicing good dental hygiene means that your implant will last many decades. Refrain from smoking, which is especially damaging to the mouth, and practice excellent oral hygiene. Use a soft-bristled brush and brush at least twice a day and floss at least once a day. Avoid damaging your teeth by not chewing on hard materials, like ice or hard candy. See your dentist at least twice a year for a checkup and your teeth will last a lifetime. What is the Real Cost of a Dental Implant? Dental implants are the only second best to natural teeth. If you are missing one or more teeth, a dental implant can replace your tooth and preserve your jaw and face, returning your natural smile. Speak with your dentist to determine what treatment plan is best for you, but if you are in good health, have healthy oral tissues and are missing one or multiple teeth, dental implants are a great solution for you. Dental implants offer a permanent solution to missing teeth. permanently to the jaw, protecting your existing teeth, preserving the existing tissue and stimulating more bone growth. They also do not require reducing the amount of healthy tooth on surrounding teeth like how bridgework requires. Despite the potential need for multiple office visits and the sometimes large upfront costs, a dental implant is the best solution to fully replacing one or more missing or lost teeth, as they last for a lifetime, unlike bridges or dentures which often need to be replaced every five to ten years. If your dentures keep slipping, if they click constantly, if they prevent you from speaking like how you used to, if you are embarrassed by having to remove them to clean them, if you are frustrated over having to deal with messy pastes and adhesives, if you are tired of not seeing your natural smile anymore, then consider dental implants. According to WebMd.com, dental implants come with a ninety-eight percent success rate. With proper care of your oral health, an implant can last your lifetime. Because a bridge or denture needs more replacements, it means more visits to the dentist’s office, more dealing with sometimes obstinate insurance, more money spent to upkeep your oral health, and ultimately more headaches and inconveniences. If you ignore a missing tooth for too long it can dramatically change the look of your face. A missing tooth can actually result in bone loss, which will severely impact your bite and can likely causing pain when chewing. It can also result in wearing down and damaging your other healthy teeth. A dental implant is so like a natural tooth that you may even forget it is there. Because it is anchored into the jaw, you won’t experience any slippage during eating or talking, and you’ll never have to remove dentures for cleaning or use adhesives to keep them in place. A dental implant is like having your missing tooth back. Understanding the process of what a typical placement of a dental implant looks like can help you make a decision if the process is right for you. The first step is an assessment by your dentist to determine whether or not your jaw has enough bone structure to support the implant. If there is not enough available structure or if your jaw is too soft you may require a bone graft to be performed in order for the site to be strengthened and not fail when the implant is installed. A bone graft is a procedure in which some bone tissue is taken from one part of the body and then grafted onto another part of the body. Commonly this area is the hip. This will strengthen the graft site and if this procedure is needed, it will require you spend some months recovering in order to allow for recovery as your jawbone to grow before the implant can be placed. The next step is to install the actual implant itself. 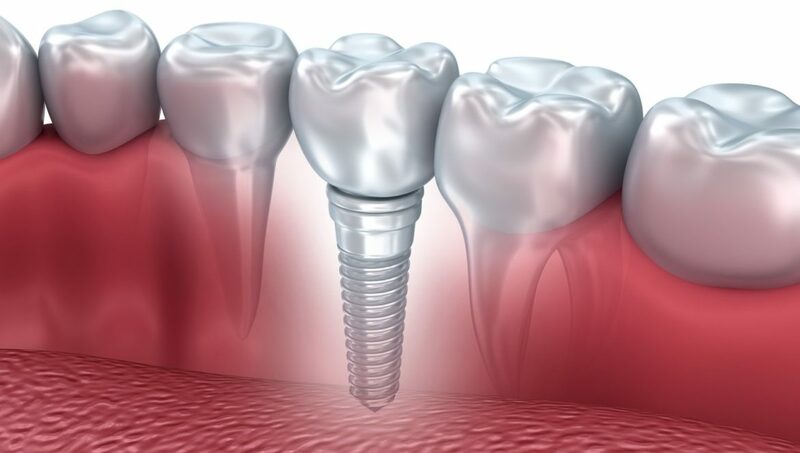 The implant is a screw-like metal rod, generally made from aluminum. The surgery is an outpatient surgery done with a type of anesthesia. There are a few forms to choose from, such as local, sedation or a general anesthesia. Each one has different recovery times, so be sure to have somebody to take you home so you can spend the day resting. After a period of recovery, the abutment will be placed. 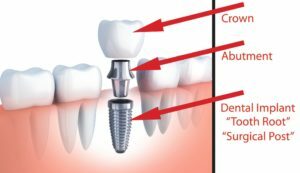 The abutment is the part of the implant on which the crown will sit. Some cases the abutment can be placed at the same time as the implant. Next, you will have to spend several months healing and recovering. In this recovery time, you are getting the bone to grow around the implant to secure in place. This is what gives an implant its longevity and its strength. After the months spent healing, you will have a mold taken of your jaw and mouth and a crown created. Congratulations! You have a new tooth! Authoritydental.org estimates that a single tooth implant can cost between $1,000 to $3,000, with the abutment and crown adding possibly $500 to $3000 dollars to the total cost of between $1,500 to $6,000 for the restoration of a tooth and the return of your smile. Keep in mind that this is the out-of-pocket price for the treatment plan without the help of implant insurance or dental plans and includes the cost of surgery, and all other associated costs, like consultation and anesthesia. What you actually pay in the end can be higher or lower depending on the exact circumstances and specifics of your treatment plan. While these costs seem high, you should still check with your dentist and your insurance to see what your actual expenses would be, which can significantly reduce the price of the procedure to more manageable levels. Keep in mind that this is a lifetime investment in your oral health, not just a cosmetic desicion. You use your mouth every day to speak with your loved ones, and to eat delicious food and drink. You’re not just paying for a new tooth, but a new ability to enjoy life. When it comes to your overall health, it begins with your mouth. Poor oral health can lead to a whole slew of disease and conditions, so making sure you maintain good oral health is key to living a long and happy life. Sometimes it starts with an innocent bite of hard candy, or perhaps a mouth injury, or just plain old tooth decay, but it always seems to come down to one thing: needing a crown to protect the tooth. Many face this decision every day and must choose from a lot of options. When you need a dental crown, you often discover you have more options than you expected. Often the differences between the options can be quite confusing, or hard to understand. Today there are a number of options available for people looking for a crown. Gone are the days where you could choose between a metal crown and a low-durability porcelain one. You no longer have to sacrifice aesthetic and beauty considerations for durability and strength. If you’re like the average patient today, you want to preserve your natural smile, and traditional porcelains may be too expensive to consider. Zirconia dental crowns offer a cheaper alternative that looks great and lasts for a long time. What is a PFM Dental Crown? PFM dental crowns, which is short for porcelain-fused-to-metal, are a type of crown that has a metal base which covers the remainder of the tooth. Then there are added layers of porcelain which are attached to the metal base. PFM dental crowns often leave a metal ring at the bottom of the crown that is quite noticeable, even to lay people. This metal ring is can become exposed when the gums recede. Additionally, The porcelain used can degrade over time, which can give the tooth a dull color inconsistent with the other natural teeth. Aesthetics is a big thing to consider when getting a crown on your teeth. PFM crowns rarely fully deliver in aesthetics. They are generally used for when a crown needs to withstand a lot of pressure or tension that often comes with chewing. Porcelain-fused-to-metal restorations have been used for over 50 years. They have been proven to last a long time, but the porcelain covering may fail, causing the breakage of a large piece of ceramic from the metal substructure. The entire crown may need replacement if the break is too large. Many dentists trust PFM crowns due to their proven track record, however, zirconia-based crowns are becoming more and more popular among patients. Why choose a Zirconia Dental Crown? A zirconia crown is the best answer to the problems presented when getting a crown for your back teeth, which do the majority of the chewing. They offer incredible strength and delightfully beautiful aesthetic, often even at a fraction of the cost. Zirconia is a much more durable material than even the metals used in conventional PFM crowns. This eliminates the worry about the crown becoming worn out or breaking over time. 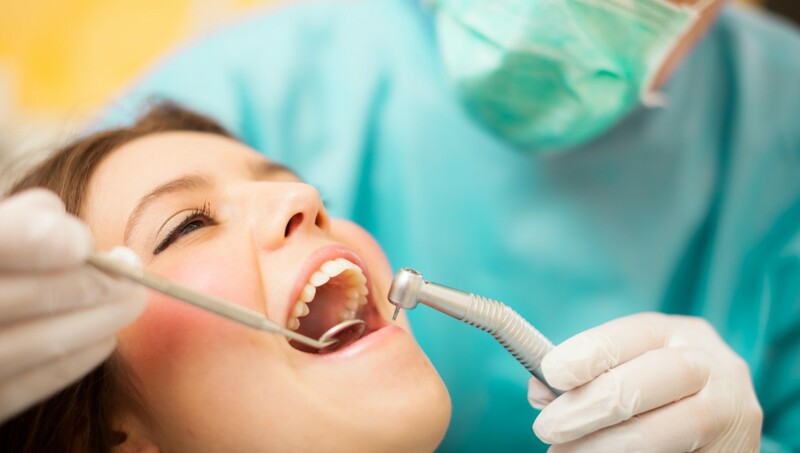 There are also other health considerations: the alloys and metals that are present in PFM crowns may cause an allergic reaction in some patients. According to dentaleconomics.com, the metals in the alloys used by PFM crowns can “result in gum tissue that is purplish in appearance, and some patients experience irritation and/or gingival recession”. Zirconia, however, is an extremely safe alternative material, as zirconia works well with the natural chemistry present in your mouth. Tissue in the mouth doesn’t pull away from the zirconia crown, and the gums often appear healthy and pink. Teeth with a PFM crown look somewhat dull in appearance, unlike zirconia and other ceramics. PFM crowns often require more of the healthy tooth to be removed for the crown to have adhered, but because zirconia crowns are so strong, a thinner dental crown can be used. A thinner dental crown means less tooth removal. What is Zirconia, and why is it better? Zirconia is a type of ceramic that is very hard and very durable. It is made up of zirconium oxide, and a stabilizer that gives it its strength. It is the hardest known ceramic in the industry and is one of the newer and better ceramics being used. The process of getting a Zirconia crown generally takes only one visit, compared to the multiple visits other porcelains require. In the first visit, the dentist will take an impression of the tooth. Next, a ‘core’ made of zirconia is then milled while in a soft state. Then, it is hardened in a furnace where it shrinks in size and reaches its highest durability. Zirconia is among the most durable material available to dentists, and this means it will last a very long time and endure the stress of chewing easily without breaking or fracturing. Then, the core is often layered with a more natural looking tooth tissue-like porcelain before being cemented in place by the dentist. Finally, any adjustments needed can easily be adjusted by the dentist on the same day as the impressions were taken, with a final cementing taking place once the dentist is sure the fit is perfect for the patient. And, because most dental offices can scan, mill, and cement the implant all in-house, they often charge a lower price for a zirconia dental crown than for other types of porcelain that would take multiple days at a separate lab to process. Another great benefit of zirconia dental crowns is that it can all be done in one session. Zirconia does not allow as much light to pass through it as other porcelains do. However, it still makes a great option for back teeth. Most dentists tend to prefer to use alternate porcelains for front teeth. As more developments continue in the creation of quality zirconia, the overall aesthetic appearance will improve, and can quite possibly be making aesthetics a non-issue. Zirconia gives the benefit of a natural looking smile, with the great combination of a long-lasting material to help prevent further damage to the tooth. How do I care for Zirconia dental crowns? Zirconia dental crowns are cared for much like normal teeth. They requiring brushing at least twice a day, as well as flossing at least once a day. Use a toothpaste containing fluoride and a soft-bristle brush. Brush in short strokes, being sure to cover every tooth surface, the chewing surface, the front, and back. Also, brush your tongue to help prevent bad breath. Why choose a Dental Implant? It is not uncommon for a patient to require a replacement for a missing tooth. Whether through an accident, or a tooth that had to be pulled, the average American will require at least one replacement tooth in their lifetime. That said, there are so many options to choose from when it comes to a good replacement for your teeth. With so many options, it can be quite confusing to decide which works best for you. Getting the tooth replaced can make the difference between restoring or even improving your natural smile to suffering from overcrowding, bone loss and a greater risk of tooth decay and gum disease. This article will cover some of the options you can consider when talking to your dentist. A dental implant is a small titanium post that is surgically placed into either jaw. A replacement tooth, generally made out of porcelain or zirconium, is affixed to the post. Dental implants can be used to replace a single tooth, several missing teeth or even whole jaw dentures. The titania post functions a lot like a natural tooth’s root, anchoring the tooth in place and keeping your natural smile intact. Implants have a number of advantages over other kinds of replacement options. They are the most similar to your natural teeth, with no slippage, or chattering. The titanium post, which is body safe and has no negative effects on your mouth’s tissues, actually encourages the bone to grow around it. This means that there is no change to your jaw or face shape, like with other forms of replacements. There are generally three steps for treatment. First, the implant is placed in the jawbone. Some patients may experience some swelling and tenderness in the area affected, so your dentist may prescribe pain medication. A diet of soft foods is often recommended post-surgery. Second, the area must be left to heal on its own. This process takes time, but it means that your implant will last far longer than any alternative. The healing varies from person to person, and it is because of this process that it is recommended that only people in good health and have adequate bone to support the implant receive them. Finally, the custom-made replacement is made in a laboratory, and on another visit the dentist will fit the replacement on the implant posts. Because these custom replacements can take some time to make, you may receive a temporary replacement while you wait for the new one to be made. In the end, dental implants can last years, or even decades, and are the best option for replacing teeth. No adjacent teeth are damaged, and it helps prevent bone loss. There are a number of cheaper options that often don’t last as long, or are more uncomfortable than implants. Often these require replacements or to damage neighboring teeth. Let’s explore these other options. A removable denture is a type of denture that can be easily taken out of the mouth, so it can be cleaned. There are two types of dentures: Partial ones only replace a small number of teeth, while full dentures can often replace a whole set of teeth. Dentures generally feature the replacement teeth attached to a plastic base, matching the color of the gums. This plastic often covers a metal framework that gives the denture its structure. The denture may also come with a metal clasp that is used to affix the denture to the teeth. Many dentures may feel tight or awkward at first, but over time and use, most patients get used to them. Keep in mind that many dentures must be work all day and be removed only for cleaning. Also, be careful of biting down on an uncomfortable denture or trying to force a denture into place. Additionally, your mouth and jaw will naturally change and shift as you age, causing your dentures to no longer work as well as it first did. It is not uncommon to need to adjust, replace or fix it, requiring multiple visits to the dentist. A resin-bonded bridge, or sometimes referred to as a Maryland Bridge, is used to replace missing front teeth, that don’t endure the strong forces associated with chewing that back teeth endure. This type of bridge has two wings on each side that attach to healthy teeth adjacent to the missing one. 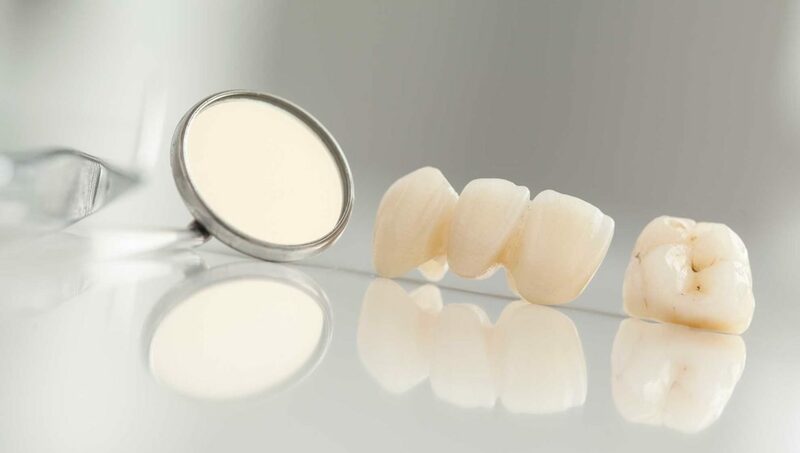 Unlike regular bridges, a resin-bonded bridge does not require preparing the teeth by grinding down the healthy teeth. Unfortunately, they often do not last as long as other bridges, or nearly as long as dental implants. Fixed bridges are a kind of restoration generally used when multiple teeth are missing. The fixed bridge is cemented into place. Once bonded, it can only be removed by a dentist. The bridge consists of two ends, or crowns, which cover the attachment teeth on either end of the bridge. Between the two crowns, is what is called a pontic, or bridge, that replaces the missing tooth. Placing a bridge can take multiple visits to the dentist. To begin, the dentist will need to prepare the teeth that will receive the crowns. These teeth generally have some part of them removed to allow for the attachment of the bridge. The dentist will then take an impression of your teeth and send it off to a lab where the bridge is made. The bridge is made out of metal, ceramics, and a glass-ceramic combination. You’ll receive a temporary bridge to cover the exposed teeth while you wait for the permanent one to be made. During the follow-up visits, the bridge is fitted, adjusted, and cemented into place. Fixed bridges affect the teeth next to the bridge and can cause them to become irritated. They also may require extra effort to clean under the pontic. The bone underneath the pontic may naturally recede, causing a change in your teeth and face structure. Why should I get a composite filling instead of an amalgam filling? Why Switch to White Composite Fillings? Golden Smiles Dental has been recognized as a top Rancho Cucamonga Dentistry practice in 2015. Congratulations to the entire team! Copyright © Golden Smiles Dental 2018. All rights reserved.